A man who called a radio host claiming he had taken an overdose is alive and back home, according to the presenter. 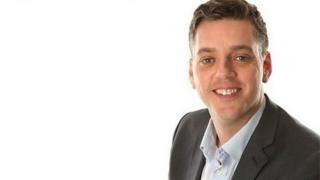 Iain Lee, who works for Talk Radio, took a call on 19 December from the man, who said he was dying on a street in Plymouth. The man, named by Mr Lee as "Chris", was taken to hospital and spent two days receiving specialist care. "It was touch and go. But. He's alive," Mr Lee said, adding the man had been "blown away" by public support. When the call came in, Mr Lee kept talking to the man on air for 30 minutes until an ambulance arrived. At the time he admitted "I thought he'd died" after "long periods of silence". Mr Lee tweeted: "He's got lots of work to do but he'll get there. It's very complicated." Members of the public thanked the presenter for the update and his actions. MazDOz tweeted: "A little teary eyed with joy over this. Wow. So thankful to hear he's alive. Glad he's home." lee_m987 also tweeted: "It's only when you get an update like this that you realise how serious it was and wasn't made up." "Thank you for looking out for him. Mental illness can feel so so lonely but we help each other," tweeted Stompy. If you or someone you know is struggling with issues raised by this story, find support through BBC Action Line .